"My mission - I will invade countries with names I can mostly pronounce, take the things we need from them, and bring it all back home." The first full trailer has debuted for the new Michael Moore documentary Where to Invade Next, one of the best docs of 2015. Seriously - I love this documentary because it really gets deep down to the issues plaguing this country and how they can be solved, if only we would open our minds and work together. Moore travels to countries around Europe in this, exploring the various ways that they've solved some of the problems we can't seem to solve, showing just how behind America really is. Also - screw the MPAA for giving this the R rating, it totally is the doc the "powers that be" don't want you to see. Description from the TIFF guide: "Academy Award-winning director Michael Moore returns with what may be his most provocative and hilarious film yet: Moore tells the Pentagon to 'stand down' — he will do the invading for America from now on." 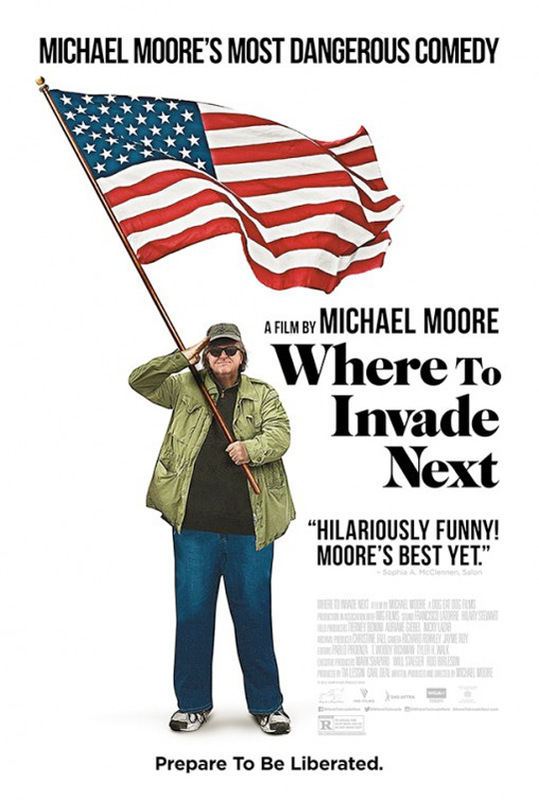 Where To Invade Next is the new documentary by filmmaker Michael Moore, of the docs Roger & Me, Bowling for Columbine, Fahrenheit 9/11 and Capitalism: A Love Story previously. The doc premiered at the Toronto Film Festival, and played at the New York Film Festival. "Where to Invade Next is Michael Moore's most dangerous and subversive film yet. It's the perfect crowd pleaser for what's shaping up to be a historic and exciting holiday season at the movies." The doc opens in select theaters starting December 23rd, expanding into wide release in January. Visit the official website. Oh, I was about to go someplace that I don't need to go on a movie fan website. I'll just not go see his movies and leave it at that. Syria obviously. But maybe Saudi in a few years, that might be a long term oil plan. The debt for schooling thing is great, people who can't afford education are losers. People who can't afford healthcare just aren't trying hard enough. Obesity and heart disease is a sign of success... I bet walking with Michael Moore is strange as he'll be so out of breath all the time. I've slated him before, but will probably watch this.